SBK09 Superbike World Championship is a simulation game that lets you play a motorcycle racing the 2009 season. It is developed by Milestone. 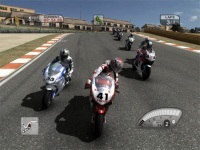 The game simulates the real aspects of all Superbike Championship attributes such as teams, riders, and tracks. In the demo version, you can play racing using the Kyalami Grand Prix Circuit in South Africa. You can also choose to play all teams like Honda, Suzuki, Yamaha, Ducati, etc. The weather can be customized to any weather condition. And the number of lap is also not restricted. The game is excellent in all aspects except the graphic atmosphere is somewhat faded. Some part of the game also takes longer time to load, but you can minimize the loading time by disabling some graphics/video features. Hard defending experience toward massive enemy attack. Play Agent 47 to resque a hostage from the mafia mansion.